(CNN) -- Rain and flooding in Yemen has killed 58 people and left an estimated 20,000 without basic shelter, a local newspaper reported Saturday. 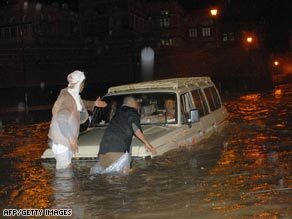 Men try to reach a vehicle carrying tourists stranded in floodwaters in the old district of Sanaa Friday. Most of the dead were in Hadramout, one of the worst-affected provinces, said Yemen Post Editor-in-Chief Hakim al-Masmari, citing the Ministry of the Interior. Officials continued to evacuate people from affected areas, but thousands remained stranded in their homes because the extensive rain has prevented help from reaching them, the newspaper said. The flooding follows several days of rain in the Middle Eastern country that is unaccustomed to more than a few inches of rain a year. The rain began Thursday as the remnants of a tropical cyclone moved over the area, said CNN forecaster Martyn Jeanes. The rain continued Friday and into the weekend as the weather system hung over the region, also bringing rain to parts of Saudi Arabia and northern Somalia, Jeanes said. Better weather conditions were expected Sunday and conditions should be "much improved" by then, Jeanes said. Thousands of families have fled Hadramout, the newspaper reported. Some evacuees are being taken to schools, but they can only accommodate about 10 percent of the people, the newspaper previously said. The Yemeni government promised to send tents as emergency shelter. More than 730 houses have been destroyed and many infrastructure projects suffered damage from the rains, according to SABA, the Yemeni news agency. The rains also caused damage to property and agricultural lands and killed a large number of livestock, SABA reported. Yemeni President Ali Abdullah Saleh ordered the formation of an emergency committee for the delivery of aid to those who were affected by heavy rains, the news agency said.